Congratulations to our board members. LHC is grateful for your leadership! On March 7, the Westside Professional Women will host its Second Annual "Empowering Women through Education" breakfast to raise money for scholarships to women graduating High School or returning to college. Breakfast begins at 7:30 at the Avon American Legion, Indiana Post 145 and LHC Executive Director Kerry Tuttle will be speaking, along with Bruce Kopp of Kopp Media. Tickets may be purchased online. Sheltering Wings needs you (and your male colleagues, friends, family…anyone male interested)! On Thursday, March 21, 2019 Sheltering Wings and Men IN Action will enlist 440+ male volunteers to go into each Hendricks County elementary school classroom to read a book that focuses on important character traits such as support, positive identity, positive peer influence and commitment to learning. The goals of this event are to teach and prompt conversations with children about important character values, engage in a volunteer opportunity and show our community that we are a community that stands for healthy values and relationships. This is a great opportunity to have a positive influence on our youth and lead with intention. Level Two Coworking is hosting a small business workshop on March 5. Access to available funding when needed is one of the top pain points that businesses of all sizes face. While traditional lending might not always be available, there are several other options available that might be more suited to your business needs. 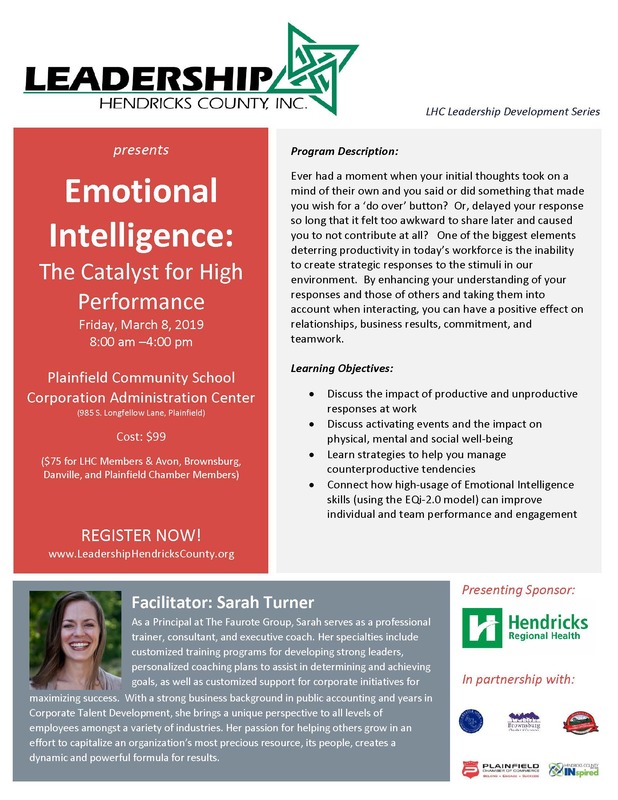 This workshop will discuss several different and non traditional areas that a business might be able to obtain funding, whether you are a start-up or ramping up for the next stage of growth. Join us on Tuesday, March 5 where we will host industry experts with knowledge in Microloans, Venture Capital, SBA Loans, Traditional Loans and more. Tickets are free but you must register in advance. 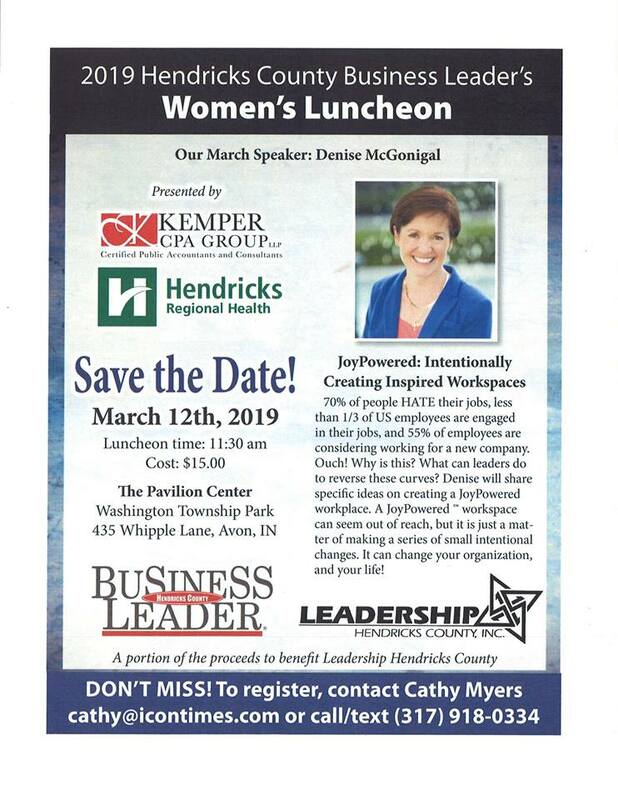 Tickets for the Women's Luncheon are available through Leadership Hendricks County. The Greater Danville Chamber of Commerce is hiring a Temporary Administrative Assistant/Event Coordinator and an Intern for Summer 2019. The primary function of the Temporary Administrative Assistant position is to fill in for the event coordinator during a leave of absence. This position will assist Chamber staff with administrative and office duties as well as help manage Chamber events. This position is required to work a minimum of 18 hours per week and up to 30 hours per week; however, days and hours are negotiable. The internship will be a part time position, averaging 18-25 hours per week. The goal of this position is to assist the Event Coordinator with planning and implementing events during the summer. The internship will also be involved with office functions. For detailed information and to obtain an application, please email Shelby Marshall, Event Coordinator for the Greater Danville Chamber of Commerce at shelby@danvillechamber.org.